Well this week I am back to work after about a week off and you know that's always tough. I'm dragging a bit, but at least I'm wearing this gorgeous shimmering matte blue, SinfulColors Matte About Blue from the Silk + Satin collection. If you see Matte About Blue in the store, don't ignore it. It looks like a pretty standard shimmery dark blue, almost navy. I like dark blues, but I own a ton of them. 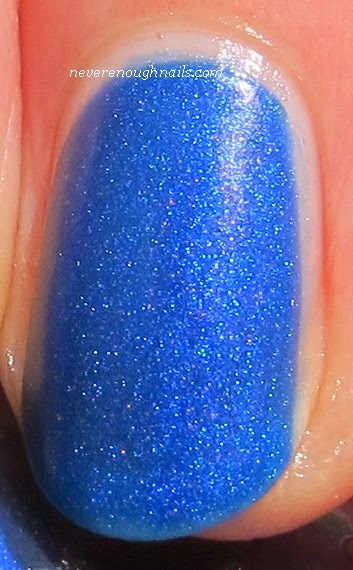 However, once Matte About Blue gets on your nails, it's a stunning deep cornflower blue matte with gorgeous shimmer. The finish reminds me a bit of the old OPI Suedes (LOVE!) and the jewel-toned blue is rich, yet bright too. This is three coats of Matte About Blue. This wasn't the most pigmented of the Silk + Satin polishes I tried, it definitely needed three coats and there is still a little VNL. The first coat was very sheer, but the second and third were better. I wish it was more pigmented, but at the same time, it's a matte so it dries pretty quickly. Three or four coats of this still takes less time than non-mattes. The formula was on the thinner side also, so be careful that it doesn't pool in your cuticles. Matte About Blue is a totally stunning blue. If you like matte shimmers like I do, you will need this. Even if you don't like matte shimmers, I bet this will look beautiful with top coat. Just keep in mind that it will need three or four coats to be opaque. SinfulColors Silk + Satin collection should be available for $1.99 at Walgreens and other mass retailers now. I really love this one too Ananka! Wish it was a two-coater, but I will still wear it!